Accuracy, using the world’s most accurate translation engines. Details: LEC provides the world’s most accurate machine translation because of its highly developed and continually updated dictionaries, technology, analysis software, and translation engines. One-click website translation. Details: Translate Personal offers translation from right inside your Internet Explorer and Firefox toolbars, so you can instantly translate any website you visit. One-click Instant Message (IM) translation. Details: Quickly translate incoming Instant Messages and insert your translated response right into the send window. Automatic language identification identifies the source language. Speech-to-text Details: Integration of Microsoft’s speech recognition for English, German, French, Spanish, Japanese, and Chinese when running under Vista or Windows 7. English, Chinese, and Japanese speech recognition is supported under XP. Translate your speech. Control translation applications with your voice. Our subscription services give you online access to all the languages that LEC supports— more than 300 language pairs. After these initial subscriptions expire, you may resubscribe to one or more language pairs for as little as $5 per month. 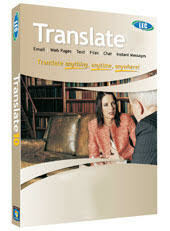 You do not need to resubscribe to continue to use Translate Personal from your desktop.